On August 4, 1945, Ensign Toyooki Seki died in a special (suicide) attack at the age of 22 when submarine I-53 launched his kaiten manned torpedo after enemy contact off Okinawa. On July 14, 1945, submarine I-53 made a sortie from Ōtsushima Kaiten Base in Yamaguchi Prefecture with six kaiten pilots who were members of the Kaiten Special Attack Corps Tamon Unit. 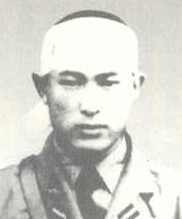 Seki was from Akita Prefecture, attended Meiji University in Tōkyō, and was a member of the 1st Class of the Navy's Flight Reserve Students (Hikō Yobi Seito). In the end I cannot be spared from death. Therefore, I will pursue life for eternity. Even though possibly my corpse may be filled with earth with a handful of ashes or my body may be at the bottom of the sea, I will be an intangible spirit that will be glorious for eternity. If there can be protection for the next generation, I believe correctly that I will maintain forever my indestructible, unending, and determined life. The matter of death is an easy matter. However, the psychological process of a human who decides to die and undertakes that is by no means either a simple matter or an easy matter. While one is tormented by that, one reaches a conclusion. That is one thing that is called human. The spirit of we military men is inspired most without regrets when we can get involved in an arena of actual fighting with smoke of guns and rain of shells. Furthermore, not necessarily saying actual fighting, it is not different at all when one has conviction to serve with death even in normal training. Without choosing the place, one reaches the greatest ferocity. I now will obtain honor with my sortie, and truly this is an honor for a young man. I promise to sink instantly the enemy. The diary entry comes from Matsugi (1971, 89). The biographical information in the first paragraph comes from Konada and Kataoka (2006, 289-91, 300-2, 374), Matsugi (1971, 89), and Mediasion (2006, 66-7, 86).